I honestly only put this up because I wanted all other San Diego Chargers fans to feel the pain along with me when they thought this headline might actually mean that Marty was coming back to coach the Bolts. He’s not. ESPN’s Chris Mortenson is reporting he may be coming back to coach in the UFL. 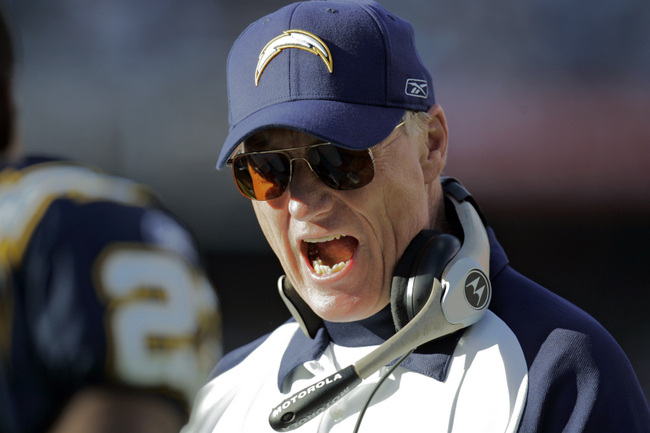 I miss Marty with the Chargers… I wish he was still the head coach, let Norv be his offensive coordinator. Yeah, yeah, I know… it would never happen. But, this does show you that Marty has been, as my boy Rampage would say, “itchin’ at the bit” to get back to coaching. Good luck, Marty. Speaking of effed up colloquialisms… I heard a dude on TV last night say he was “sweating like a banshee”… isn’t it “screaming like a banshee”? What the hell is happening? Thoughts of MartyBall has my mind all cluttered. This entry was posted in Football, News, NFL and tagged Bolts, Chargers, Chris Mortenson, ESPN, Marty Schottenheimer is Coming Back to Coach?, MartyBall, NFL, San Diego Chargers, UFL. Bookmark the permalink.